This gorgeous sterling silver bar necklace is very popular in our personalized jewelry range. The necklace is light so makes the perfect item of jewelry for every day wear. It also makes the perfect gift for your mother, bridesmaids or special lady in your life. 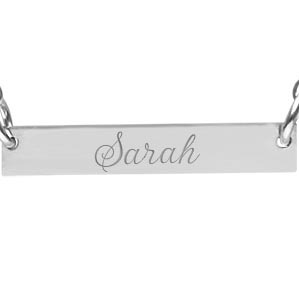 The bar necklace works well as a name necklace displaying your name or a message on this beautiful piece of jewelry. The necklace includes a feminine 17 23/32" (45cm) sterling silver chain and can be customized with up to 12 characters with a variety of fonts to choose from.